The beer industry is like any other economic enterprise - it comes with wins and losses, predictions and forecasts, and an overall report of health and stability. There's more to beer than cases, kegs, and a cult following. Here's how brews fared and what consumers can continue to expect into the new year. 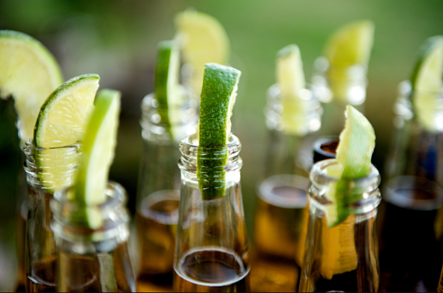 Mexican imports specifically Corona and Modelo is expected to grow by 17 percent by the end of the year … but why? A different sector of the beer market is claiming more bar taps and retail shelf space. “They get stronger and stronger by the day, as importers like Constellation Brands and Heineken get savvier,” Harry Schuhmacher, editor and publisher of industry publication Beer Business Daily. The appeal of beers like Corona is they are easy to drink, like some U.S.-brewed domestic lagers and pilsners but with an added touch of specialness – there’s something a little more discerning in an imported beer vs. domestic. Diversity in demographics also continues to play a role in the increasing demand for Mexican beers as the country’s Hispanic population grows. Corona Premier will be the company's newest release, and will be marketed as a lower carb alternative to the classic. They say there’s an alcoholic beverage for everyone’s preference and taste – you can add spiked soda and fizzy hard seltzers to the list. If fewer calories, lower sugar or carb content is what consumers are looking for, they can find that plus a respectable five percent alcohol content per can in hard seltzers - the perfect drink of choice for health conscious folks or anyone looking for an alternative easy-sipper. White Claw Hard Seltzer is the newest product line from Mark Anthony Brands – the same company behind the Mike’s Hard line – and debuted three flavors; lime, black cherry, and ruby grapefruit. "Mike’s Hard Lemonade has been meeting the consumer need for refreshing fruit flavors for over 20 years. With the subtle and crisp flavor of White Claw, this new category meets the needs of consumers who were previously not exploring with flavor because there hadn’t been an option for them,” said Phil Rosse, president of Mike's Hard Lemonade Co.
Hard sodas alone racked up $116 million in sales in 2015 alone – official industry numbers for 2016 should show an increase in both revenue and consumption. Riffs on iconic flavors like root beer, orange, ginger ale, and cherry cola piqued the interest of consumers looking to quench nostalgia with a sweet sip of memories and again, proved the point that there is an alcoholic beverage for nearly every kind of drinker. And, every kind of consumer wants variety, which is supported by the massive 57 percent increase in flavored malt beverage growth between 2010 and 2015. Henry's Hard Grape - plus a line of its own hard seltzers - will be on the horizon in early 2017. And while Miller Lite continues to be an all-American favorite in the domestic category, it was challenged in the on-premise setting in bars and restaurants. That means consumers are expanding their horizons and ordering beverages other than classic standby brands - especially where domestic is concerned - when dining out. Imported and craft beer offerings continue to take up taplines and happy hours menus, while Miller Lite sales declined over the year. National ad campaigns that began last month will remind consumers that the iconic lager has won four gold medals at the Brewers Association World Beer Cup, the recent gold coming in 2016's competition, where it won a gold medal from among 22 entries in the American-style light lager category. Economy beer brands vying for a bigger piece of the pie as well, with labels like Milwaukee’s Best investing in new branding, while increasing alcohol content to combat the sales slump.